Then you get a Stainless Steel Garden Sprayer A 1 gallon size will fit on the stove top, be enough for 2 people, and it you remove the pumping mechanism, it can store under the bed! 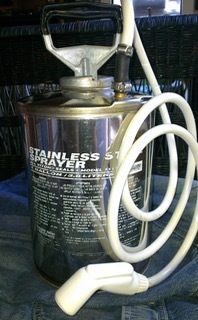 This is how I did it on my RL Flomaster Stainless Steel sprayer - your mileage may vary. Remove the hose from the bug sprayer - all you need to save is the thin plastic “dip tube” that goes into the tank. This leaves you with a barbed fitting on the tank - attach one end of the fuel line to this. Cut off the plumbing fitting at the end of the sink sprayer. Insert the “dip tube” about 1 inch into the end of the sink sprayer hose (you may need to cut off any “flare” that the dip tube has). Insert the sink sprayer hose into the other end of the fuel line - you may need to use glycerin (or dish soap) to help the sink sprayer hose slide into the fuel line. Use a hose clamp to secure the fuel line to the bug sprayer, the other to secure the fuel line to the sink sprayer hose - the “dip tube” will prevent the hose clamp from collapsing the sink sprayer hose. This works great if you want/need a hot water source for doing dishes, as well as a handy water source you can put on a picnic table, etc. You can also carry it/keep it in a small bucket with some reflextix insulation around it to keep it warm - the bucket will prevent the metal bottom of the sprayer from scratching surfaces, too. Heat until you like the temperature. Insert the pumping mechanism and take it into your tent (we put it on one collapsible foot stool and sit on a second one). Pump up the bug sprayer, activate the handheld sink sprayer and enjoy a hot shower every morning! No batteries needed, very minimal equipment - you just have to occasionally pump the bug sprayer to keep the pressure up. The shower tent has a removable floor so you can carry your used shower water and put it in YOUR grey water tank or a campsite drain. Getting a slatted wood “bathmat” of some kind is nice to keep your feet clean. Having a chair outside the tent helps, too. 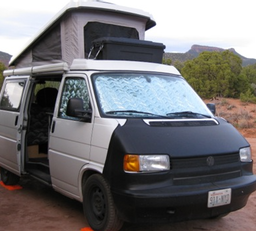 The Paha Que is worth every penny - easy to set up, sturdy, with lots of neat, well thought out features.